Ramp B and Ramp C bridges are the focal point of the IA-5/I-35 Interchange. Soaring over I-35, Ramp B provides westbound IA-5 traffic access to southbound I-35. Ramp C carries southbound I-35 traffic to eastbound IA-5 as it stretches over I-35 and under Ramp B. The Ramp B bridge, on top, carries one lane of traffic and consists of six spans having a total length of 824-feet. The Ramp C bridge, below, carries two lanes of traffic and consists of five spans having a total length of 664-feet. These bridges are among the first in the State of Iowa to implement several new, exciting aesthetic features which provide a clean, refreshing appearance. Slender members and clean lines distinguish the striking, tall piers of the Ramp B bridge, while a bold concrete rustication pattern marks the stout piers of the Ramp C bridge. A special surface finish on piers, abutments, and rails of both bridges provides a uniform appearance and visual interest. The open combination rails admit light to the bridge decks and provide an unrestricted view of the surrounding area. 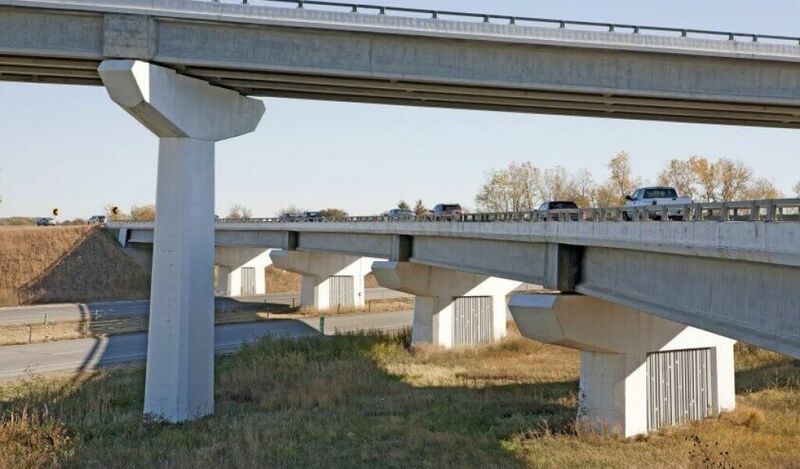 Both the Ramp B and Ramp C bridges utilize existing technology in a unique application through the use of straight precast concrete beams in the curved superstructures. Computer software facilitated the use of coordinate geometry to achieve an elegantly simple beam layout, significantly reducing material and construction costs. The majority of beams used in both bridges are of standard lengths that are commonly available, and many of the beams in a given span are of the same length. 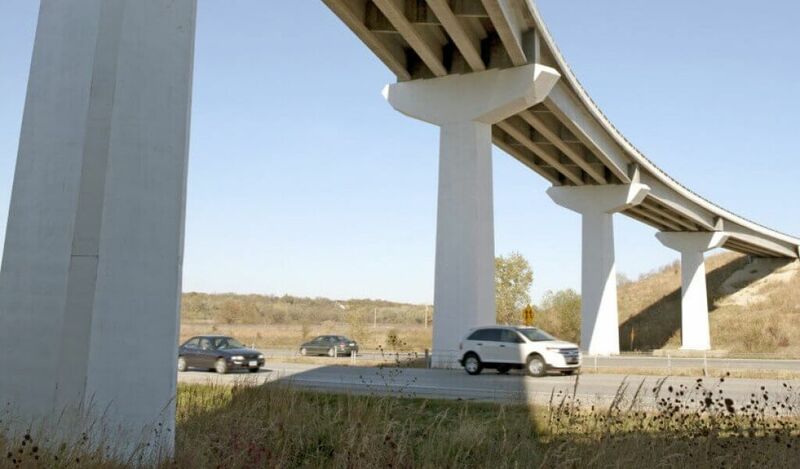 These bridges, as vital links connecting the new relocated IA-5 bypass to I-35, will enable safe, efficient traffic flow at a major interchange. The new IA-5 bypass will support strong economic activity and development to the south and west of the Des Moines metropolitan area. Aesthetic features inspire further creativity and set a high standard of achievement, as they extend the interchange beyond functionality and elevate it to gracefully blend with its natural surroundings and approaching roadways. The final construction cost for both structures was estimated to have saved at least $10 per square foot, compared to conventional curved continuous welded plate girder designs. This translates to a significant cost savings of over $470,000. An ACEC Iowa Engineering Excellence Award was given in honor of this project.